about restoring closed tabs, you might have wondered if you can just get the browser to always start up where you left off. This would save you the trouble of re-opening your windows and tabs manually. It turns out you can do this easily. Open the Tools menu and select "Options" (or, if you're using a Mac, open "Preferences") and go to the "Basics" tab. The first section on the first page of options is called "On startup:", and in there you'll see an option to "Reopen the pages that were open last". 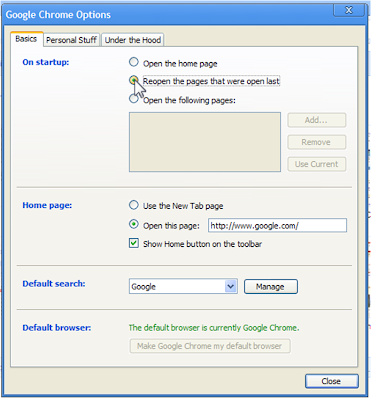 Once you select this, Google Chrome will start up showing the same pages that were open when you shut down. Finally, if the browser ever crashes, the next time you start up you'll have the option at the top of your window to restore your previous windows and tabs, even if you haven't changed what appears on startup. When reading the last tip about restoring closed tabs, you might have wondered if you can just get the browser to always start up where you left off. 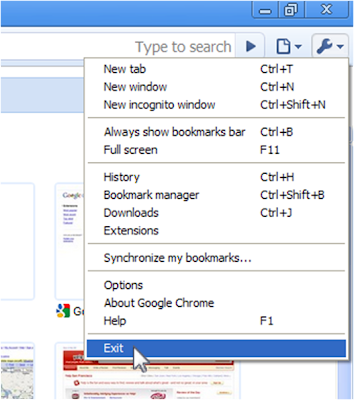 This would save you the trouble of re-opening your windows and tabs manually. place. The Google Chrome team is excited to introduce a new beta feature to help our users navigate the multilingual web: instant machine translation of webpages, without the need for any browser extensions or plug-ins. How does it work? When the language of the webpage you're viewing is different from your preferred language setting, Chrome will display a prompt asking if you'd like the page to be translated for you using Google Translate. For more on how automatic translation in Chrome works, read on in our Help Center article. We hope that the development of online translation tools like this one will help make all the world's information universally accessible in an easy, frictionless way – imagine reading a diversity of foreign language news sources in your mother tongue, or easily conducting online commerce across borders and languages. You can read more about these features, or watch videos explaining how your privacy is handled in Chrome's various features including search and suggestions, browser cookies, Safe Browsing technology, and automatic security updates. Try out all these new features for yourself in today's beta release. For those of you already on the beta channel, you'll soon be updated automatically. And for those of you on the stable channel, we'll be making Chrome's new translation and privacy features available to you in the coming weeks. Till our next update, auf Wiedersehen! Whether you're catching up on your favorite Arabic gameshow, getting up to speed on the latest Korean mobile gadgetry, or researching the local perspective for a dream trip to Machu Picchu, we're all constantly reminded that the internet is an amazingly multilingual place. The Google Chrome team is excited to introduce a new beta feature to help our users navigate the multilingual web: instant machine translation of webpages, without the need for any browser extensions or plug-ins.